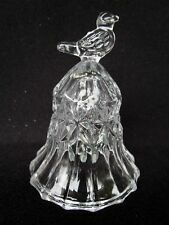 German Hofbauer Byrdes 24% Leaded Crystal Bell Song Bird 3 3/4"
~~Hofbauer Byrdes~~. Heavy Crystal Cut Glass. Great Collectible. Quality Made Elegant Item. Very Sparkly. HOFBAUER 1985. LEAD CRYSTAL BIRD BELL. 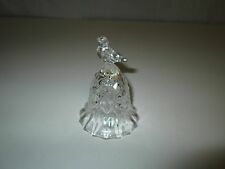 Germany vintage small HOFBAUER BIRD BELL clear LEAD CRYSTAL 6!" Lead Crystal Bird Bell Bohemian Hofbauer Byrdes Germany 8"
Lot of : Crystal Bleikristall Hofbauer Lead Ruby Red Love Byrdes : all in good condition no major damage or chips 1). 10" Vase appears to be a darker red color than the rest of the items/see pictures 2). Lidded candy dish 3). sugar bowl with lid/no spoon 4). beautiful bell I can send specific pictures upon request all has tiny tiny signs of wear-like small scuff marking on red or tiny scratch-see pictures however no major damage no major damage no chips no cracks crystal lead Wrapped with love and Shipped with USPS Priority Mail. This is an exceptional Byrdes crystal bell by Hofbauer with clear bird on top. What a showy item! This is an exceptional Byrdes crystal bell by Hofbauer with frosted bird on top. What a showy item! Beautiful large Hofbauer Lead Crystal Bird Bell. This one of Hofbauer's most elegant pieces. It is from Hofbauer's Byrdes Collection. I has a cute bird sitting on the top. This beautiful piece is made out of lead crystal and was made in Germany. 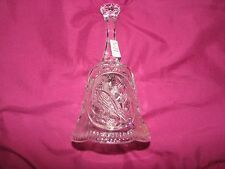 This is a beautiful Lead Crystal collectable Bell. It istands 5 3/4" tall and is 2 1/2" wide. I find it best to do it over a bed or sofa while gently cutting tape or bindings. Happy hunting! Vintage Hofbauer RED BYRDES Bird Bell German Lead Crystal 7"
Vintage Hofbauer RED BYRDES Bird Bell German Lead Crystal 7". Shipped with USPS Priority Mail. 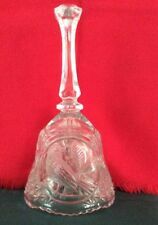 Hofbauer Byrdes Bird Glass Bell. (This is a decorative/non-functional bell w/o clapper.). 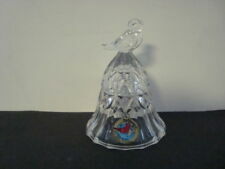 Crystal cristal green engraved rose and birds bell 6".